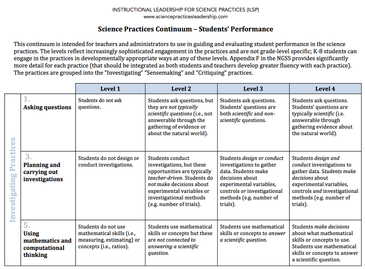 The Science Practices Continuum is intended for teachers and administrators to use in guiding and evaluating science practice-based instruction (McNeill, Katsh-Singer & Pelletier, 2015). 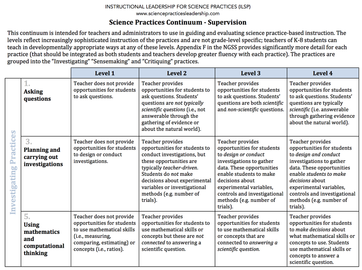 For each science practice, the Continuum illustrates different levels of instruction. The goal is to highlight key levers for each practice to help instruction move farther along the Continuum. Two versions of the continuum are provided below, one focused on supervision and the other focused on instruction. Click the images below to view the full documents.